In part 1 of this blog we looked at the development of an app called PersonA for increasing physical activity that includes a function for providing peer support. Specifically, we looked at how Al Ayuba and colleagues used theoretical health behavior theories to inform app development and how users were able to test the usability of the app. 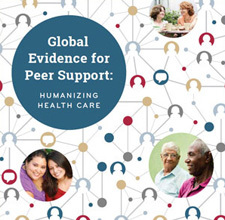 In part 2, we will examine how the authors combined usability testing and health theory to incorporate peer support functions into their app and results from the usability testing. PersonA has two mechanisms to facilitate peer and social support. The authors believe the app can persuade people to change behaviors via social comparison (comparing oneself to others) and direct peer interactions. Previously on this blog we have provided updates on mobile apps that incorporate peer and social support. Now, with the increasing number of apps coming onto the market, more transparency on the development and testing process may raise confidence in the effectiveness of these apps and lead to better refinements. A recent article by Al Ayuba and colleagues provides an in-depth description of the development of a persuasive social mHealth application called PersonA designed to monitor and motivate users to increase physical activity. The social support components are a central part of the app design. Users can communicate and compare their performance with that of their peers. According to the authors, the social component is important because published literature indicates that social support has the capacity to increase physical activity or at a minimum, reduce program attrition.